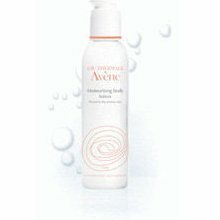 Very rich in Avene Thermal Spring Water and triglycerides, this hydrating body lotion quickly absorbs to moisturize and protect, while leaving the skin with a smooth, non-greasy feel. Benefits:Soothes skin with the Avene thermal spring water. Restores skin softness and suppleness. Recommended for normal to dry skin that is sensitive.